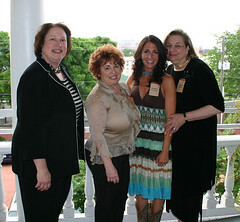 Sherrie Grunfeld, Eva Wilensky, Jenifer Rotenstreich and Leni Epstein at the 25th anniversary celebration for Birmingham's Community Kitchens, on April 25. Wilensky was presented the Marsha M. Greene Service Award for outstanding volunteer, and Grunfeld accepted an award on behalf of the Temple Beth-El Social Action Committee. Rotenstreich and Epstein are board members at the social service agency. The late Chico Bomchel spearheaded fundraising for the agency's kitchen at Grace Episcopal Church, which serves meals daily to the underprivileged. It may be one of the few kitchens in a church that has a mezuzah on the door. The local Jewish community coordinates Easter, Thanksgiving and Christmas lunches each year at Grace Episcopal.